Facebook reads your private messages, California class-action suit alleges. Facebook has been hit with another privacy lawsuit. This allegation is not entirely new. 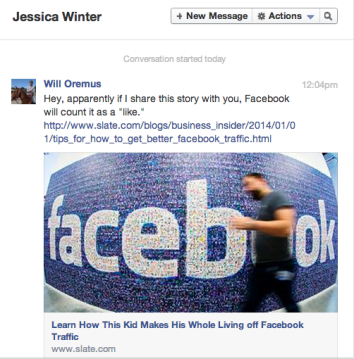 Facebook seemed to confirm last year that it counts links shared in private messages as likes on public websites. As Marketing Land’s Greg Sterling points out, Google has faced similar charges over its longstanding practice of scanning Gmail users’ emails in order to show them targeted advertisements. The Facebook suit claims that, in essence, Facebook is “intercepting” and “reading” your private messages, a violation of the federal Electronic Communications Privacy Act. Facebook is likely to argue that there’s a difference between having its computers scan your messages automatically for certain types of content and actually reading them. It will be interesting to see whether the court agrees—and, just as importantly, whether Facebook’s users agree. My guess is that people are more comfortable having their messages scanned by computers than read by humans—but that, on the whole, they’d prefer not to have the contents of their personal communications analyzed by third parties at all. Then again, in an era when big tech companies and government spies alike are mining all the data they can get their hands on, we may not have much of a choice. The full class action suit is here.